The Office of Human Dignity & Life Initiatives presents the Human Dignity Lecture, Spring 2015. The speaker is Chinese civil rights activist Chen Guangcheng who will talk on “Interpreting Reform: Human Dignity & Human Rights in Contemporary China.” This lecture will take place on April 7 at 7:30pm in the McKenna Hall Auditorium. 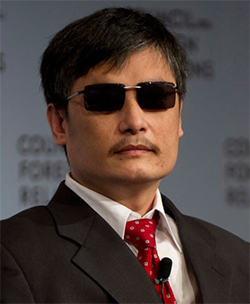 As a self-trained lawyer, Chen Guangcheng escaped house arrest while being held as a political dissident in 2012. His lecture will address the recent reforms in China, including the relaxation of the one-child policy and the promise of the Chinese government to govern by “the rule of law,” and examine whether or not these reforms signal a change of course in the government’s attitudes toward the inviolability of human dignity and its attendant rights. Co-sponsors include the Center for Civil and Human Rights; the Center for Ethics and Culture; the Center for Social Concerns; the Kellogg Institute for International Studies; and the Liu Institute for Asia and Asian Studies. This event is free and open to the public.